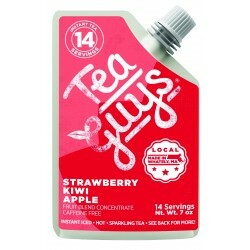 Description: Deliciously sweet strawberries are blended with kiwi to create a fruit tisane that is both flavorful and refreshing. Wonderful iced or add to your favorite lemonade for a cooling treat. Naturally caffeine free. Ingredients: an infusion of (water, apple, hibiscus, rose hips, flavors, freeze-dried kiwi, freeze-dried strawberry, dried kiwi slices, dried strawberry), cane sugar, lemon juice, sea salt, citric acid.